I had written a post yesterday regarding the importance of the Eagles getting off to a fast start. Keeping with the theme, but drilling down to specifics I think McNabb needs to get off to a fast start. In terms of challenging McNabb for the #1 QB spot this preseason Vick and Kolb have shown little. Though Kolb may mentally know the Eagles system he still looks hesitant and confused in game action. As his play on Thursday night showed there is too much rust on Vick's QB game to expect him to contribute this season as a pure QB. His value comes on "gimmick" plays. The best thing that could of happened for McNabb was for Vick to be suspended for the season's first 2 games. 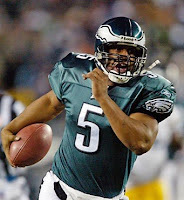 If McNabb can get off to a fast start he can squash any cries or controversy that Vick should be given a shot at QB. No more "We want Vick" chants in the Linc. Show everyone again that this isMcNabb's team, McNabb's franchise! Hopefully a fast start will also cause Reid and Mornhinweg to change their thinking on the number of times that Vick is inserted into the line-up on game day. A fast start will show offensive cohesion and rhythm. Put big points on the board early against the Panthers and Saints. Show the coaches that altering the game plan significantly for Vick will hinder the offense, not help. Keep the Vick plays to 5 snaps or less. McNabb and the Eagles need a 2-0 start.